CLICK ON THE “PEARL” TO ENLARGE IT! Three books I read during the past year marked what I see as an important breakthrough that indicates a shift which is taking place beneath the surface, as always indicated first by literature, art and research that direct discussion to an unexpected place. 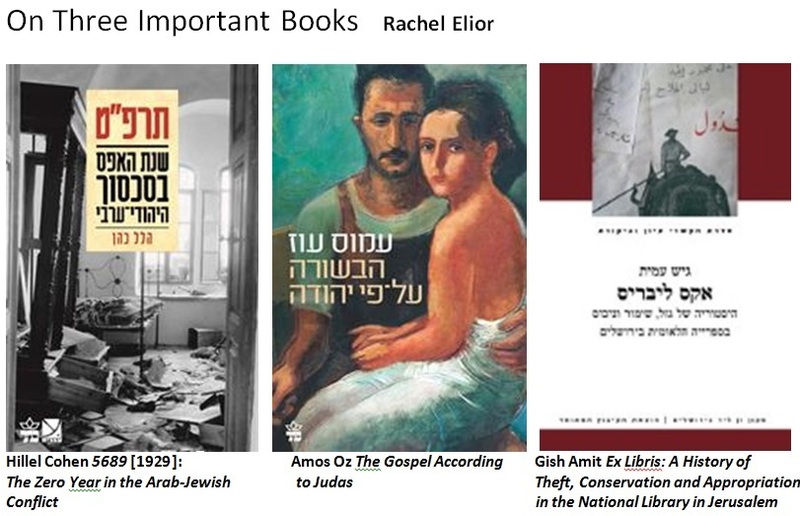 The books are Hillel Cohen’s 5689 : The Zero Year in the Arab–Jewish Conflict (Jerusalem: Keter, 2013); Amos Oz’s The Gospel According to Judas (Jerusalem: Keter, 2014); and Gish Amit’s Ex Libris: A History of Theft, Conservation and Appropriation in the National Library in Jerusalem (Jerusalem: Van Leer Institute and Hakibbutz Hameuhad Publishing House, 2014). The common denominator of these three disturbing books, which are so different in their subject matters, their genres, and their styles, yet so similar in that they’re written with much wisdom, with bold daring, with compassion and breadth of vision, are based on comprehensive, multi-lingual research and excel in complexity of argument and clarity of expression, is that they tell unfamiliar, alternative stories which create a crack in what seems to be a known reality. These stories are based on attentive listening to silenced voices raised from the archives that preserve forgotten memories, and on reading inner pages of newspapers from the period that reveal forgotten positions, as well as on study of protected documents and unknown testimonies, all of which tell familiar stories from a different, unfamiliar angle. All three engage in exposing unexpected perspectives on the complex story that underlies our existence here. The three books, which deal with the tragedies connected with riots and wars, with the terrible price of bloodshed, and with the suffering that has stemmed from various injustices that occurred in the 20th century and with their complex contexts, pave an indirect road to understanding, to dialogue, to reconciliation and apology/forgiveness, by virtue of the supremely important acknowledgment that in Palestine/Israeland until 1948 and in the State of Israel since 1948 there is more than one historiography with which people know who is right and who is guilty in everything concerned with relations between Jews and Arabs before and after the establishment of the state, and relations between the various Jewish ethnicities that arrived here from all over the world as to a land of sanctuary, or as to the land and the home of the Jewish people, and not infrequently found it – as their testimonies horrendously reveal – to be, for them, a land of desolation. All three books clearly show that that there are many more perspectives than one certain and decisive narrative of the complex reality in a period of catastrophe, war and destruction, in a place of suffering, bereavement, injustice and loss. In such a complex period and a place so full of such challenges and difficulties, it is of great importance to listen attentively to alternative stories of individuals, peoples and groups, which tell of diverse experiences and memories, and recount contradictory, subversive and diverse national stories about the same stretch of land in which different cultures and different languages exist and in which different nations live, just as it is supremely important to become acquainted with the stories of repressed or forgotten ethnic or other groups that feel they have suffered injustice, that feel excluded, silenced, humiliated, robbed or dispossessed. It is most advisable to become acquainted with the arguments of the various sides, which are based on diverse memories and initial claims – and to examine these, even if one is not obliged to agree with everything, to justify uncritically, or to identify automatically with the alternative stories. This is necessary because it is our duty to remember and to remind others that in an open society no person, body or institution has a monopoly on the truth, and diverse truths can co-exist peacefully beside one another. It is very advisable, too, to remember that any attempt to make the other side – be that a nation, or people, or ethnicity, exile or dispersion, culture or language – forget its life experience and its testimony, to erase its story, to delete its memories and to deny its experiences, or to make it give up its past and its pain, is doomed to failure, not only because this position is immoral, but also because it isn’t practical or effective and isn’t possible as long as even only one witness or one testimony remains. On the matters that these three books deal with, there exist since 1882 thousands of documents and thousands of written and oral testimonies in archives and libraries throughout the world, in a multiplicity of languages. Hillel Cohen’s 5689  deals with the ‘riots’ that occurred in 1929, when the Arab offensive against Jewish communities in Palestine began. The author sees this as the zero year in the Arab-Jewish conflict, when Jewish communities – old and new, Zionist and ultra-Orthodox, Ashkenazi and Mizrahi, religious and secular, socialistic and traditional (which were known as ‘the old Yishuv’ and ‘the pioneers’) – were attacked without distinction of political tendency or length of residence in the country, because in the eyes of the Muslims in the late ’20s – who most probably identified the potential for Jewish unity in the framework of Zionism even before it first became a reality during the ’30s – what was common to all these Jewish groupings, which were very different to one another – that all of them believed in the existence of the Jewish people and in its right to immigrate to the land of its fathers and to establish a Jewish state there, whether by human agency or divine agency – was far greater than what was different. The uniqueness of 5689 lies in the fact that its author – who deserves all praise for his meticulous reading in the State of Israel Archive, the Central Zionist Archive, the Meiri House Archive in Safed, the British National Archive, the Archive of the Supreme Muslim Council, documents published in the Havliyat Alquds periodical, historical and literary research studies, and many other newspapers in Arabic, English and Hebrew – has juxtaposed two opposed national narratives as well as alternative stories that arose in each of these communities, in order to propose a comprehensive and less one-sided view than the one that is common in Israel. He has shown that from the point of view of the Muslim attackers in 1929–30, the Arabs were targeting not Jewish neighbors, but enemies and invaders who were trying to take control of their land. To the attackers – according to testimonies from the period – the attacked, because of the protection they had received from the British since the Balfour Declaration, were allies of a foreign power and agents of a colonialist regime that had to be resisted, and were therefore a legitimate target for attack. From the point of view of the Jews, who saw themselves as returning to the land of their fathers of their own will, and certainly not as enemies or invaders doing the bidding of others, and as victims being slaughtered although they’d committed no injustice, the Arab offensive accelerated Jewish unity in the framework of Zionism, because after the bloody offensive all the diverse currents in the Jewish Yishuv understood that as Jews they had no political home other than the Zionist home. They could participate in it actively or merely shelter in it at times of storm, but they could not propose a real political alternative in the form of joining with the Arabs in the country, because the Arabs, who saw all the Jews as enemies trying to take control of their land, were not interested in this. Many in the Jewish Yishuv with all its branches saw the massacres that occurred in places where no secular Hebrew/Jewish defense force sponsored by the organized Jewish workers movement was active, and the successes of the Jewish defenders in warding away attacks in places where they were active, as decisive proof that only the Jewish fighters of the ‘Haganah’ stood between the continued existence of the Jewish Yishuv and its annihilation. The Zionist movement, which always saw itself as a national liberation movement and as a project to rescue a persecuted people that was seeking sanctuary in the land of its fathers to escape the threat of anti-Semitism, has always rejected the colonialist analysis framed by the Arab side. Amos Oz’s latest book, The Gospel According to Judas, deals with human aloneness beyond the everyday discourse, with the trenchant muteness that lies behind polite speech, and with the incurable abysses of pain and despair borne by bereaved parents and spouses of people killed in riots and wars, people who mourn all their lives for their fallen children or loved ones and for whose suffering, pain, anger and feelings of guilt there is no consolation. This is even stronger in the cases of those who opposed the war and its aims, those whose children, relatives and/or loved ones paid the terrible price with their lives, in opposition to the opinions and beliefs of their relatives who protested against it with all their might, and tried in every way possible to halt it and them. The book, which deals with these tormented people and their bitter fate, also deals with an alternative story about what could have occurred in the decades prior to the War of Independence and during it, had people listened to one of the leaders of the Yishuv who opposed the establishment of the state at the cost of a war that endangered the existence of the entire Zionist project, and had they followed him and his colleagues from the circles such as Brit Shalom [the “Peace Covenant”] that supported peaceful coexistence with no sovereign borders. The dead protagonist is actually two: Shealtiel Abravanel, a renowned lawyer, Orientalist, and a senior member of the institutions administering the Yishuv, who died as a tormented and despised traitor because he opposed with all his might the war entailed in establishing the state; and his son-in-law Micha Wald, a brilliant researcher of mathematics at the Hebrew University, a cripple who volunteered for combat and was slaughtered and castrated in the battles at Shaar Hagai on April 2, 1948. The living protagonist, Shmuel, researcher of treachery and loyalty and opponent of wars, is very interested in the fate of the dead protagonist Shealtiel Abravanel the “traitor”, in whose former home he lives as a tenant, together with Abravanel’s daughter, Atalia, the widowed bride of the war victim Micha Wald, and Micha’s bereaved father, Gershom Wald, an old, solitary, crippled, scholarly man, a retired teacher of History at the Gymnasia Herzlia high school in Jerusalem, whom Shmuel takes care of and keeps company several hours a day for his rent and a modest allowance. 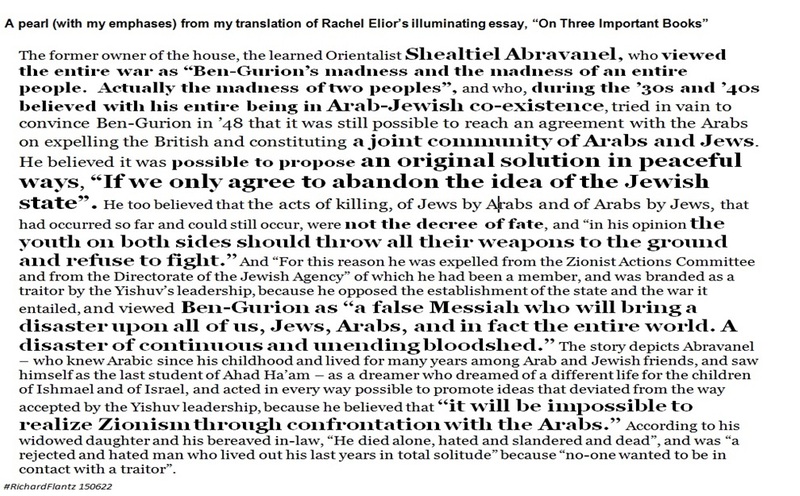 The former owner of the house, the learned Orientalist Shealtiel Abravanel, who viewed the entire war as “Ben-Gurion’s madness and the madness of an entire people. Actually the madness of two peoples”, and who, during the ’30s and ’40s believed with his entire being in Arab-Jewish co-existence, tried in vain to convince Ben-Gurion in ’48 that it was still possible to reach an agreement with the Arabs on expelling the British and constituting a joint community of Arabs and Jews. He believed it was possible to propose an original solution in peaceful ways, “If we only agree to abandon the idea of the Jewish state”. He too believed that the acts of killing, of Jews by Arabs and of Arabs by Jews, that had occurred so far and could still occur, were not the decree of fate, and “in his opinion the youth on both sides should throw all their weapons to the ground and refuse to fight.” And “For this reason he was expelled from the Zionist Actions Committee and from the Directorate of the Jewish Agency” of which he had been a member, and was branded as a traitor by the Yishuv’s leadership, because he opposed the establishment of the state and the war it entailed, and viewed Ben-Gurion as “a false Messiah who will bring a disaster upon all of us, Jews, Arabs, and in fact the entire world. A disaster of continuous and unending bloodshed.” The story depicts Abravanel – who knew Arabic since his childhood and lived for many years among Arab and Jewish friends, and saw himself as the last student of Ahad Ha’am – as a dreamer who dreamed of a different life for the children of Ishmael and of Israel, and acted in every way possible to promote ideas that deviated from the way accepted by the Yishuv leadership, because he believed that “it will be impossible to realize Zionism through confrontation with the Arabs.” According to his widowed daughter and his bereaved in-law, “He died alone, hated and slandered and dead”, and was “a rejected and hated man who lived out his last years in total solitude” because “no-one wanted to be in contact with a traitor”. The juxtaposition of the warp threads – of the relations of Christianity to Judaism and of Jews to Christians since the time of Jesus, the ultimate victim of betrayal, and Judas Iscariot, the absolute betrayer, after whom in the Christian world all the Jews were called “perfidis Judaeis”, “perfidious Jews” (and Shmuel Asch sees him as the truly loyal disciple) – with the weft threads – of the relations of Jews and Muslims who generally see one another as enemies, invaders, treacherous and murderous neighbors, and only in rare instances see one another as good neighbors, comrades, and partners in coexistence – provokes thought from unexpected angles. Gish Amit’s Ex Libris deals with three events that occurred inside the National Library in Jerusalem between 1946 and 1955, about which it may be said “The more you know, the more you grieve”: the “Treasures of the Diaspora” project, in which hundreds of thousands of books belonging to Jews plundered by the Nazis were brought to Jerusalem after the Second World War; the collecting, in the course of the 1948 war, of some 30,000 books that had been privately owned by Palestinians, and of thousands of abandoned books that had belonged to Moslem and Christian educational institutions and churches, and making them part of the National Library’s collections; and the collecting of thousands of books and manuscripts of Jews from Yemen who immigrated to Israel in 1949–1950, which were transferred without their owners’ knowledge and certainly against their will to the cellars of the National Library. The author argues that these three historical projects are closely inter-related, in that they show the ways in which Zionism appropriated the treasures of cultures and heritages that it negated – the heritage of the European Jewish diaspora, the native Palestinian heritage, and the heritage of Jews from Arab and Islamic countries. All three cases, he says, display a movement that separates people from their cultures in a framework of shaping a new national identity and a sovereign national culture. Two opposing points of view about the books that were brought to the National Library in 1948 from private and public Palestinian libraries illustrate this. During the War of Independence the National Library saw itself as having “developed extensive action of rescuing books from ruin in the abandoned Arab neighborhoods. As a consequence of this, tens of thousands of books were collected, and they are being preserved safely until their fate becomes clear” (Shlomo Shumani, “The National Library”, The Hebrew Encyclopedia, 1957). 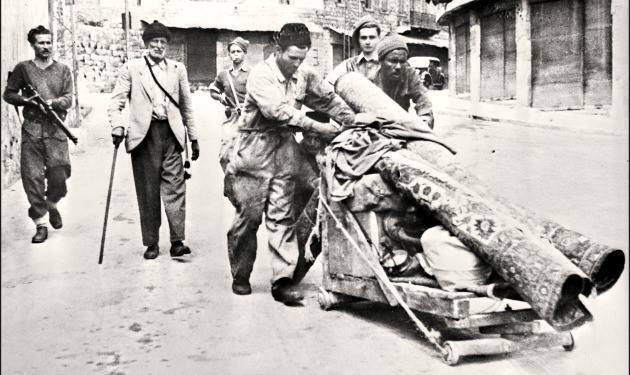 For the Palestinians, on the other hand, ever since 1948 “this was an event of cultural dispossession and a disaster that the war brought down upon Palestinian culture”. The question of the victor’s right over the cultural property of the enemy (and equally over that of the refugee, the occupied and the exiled) is an important part of the international law that was consolidated following the world wars, and “absolutely prohibits the confiscation or looting of private property and demands that this property be returned to its owner at the war’s end. The confiscation and appropriation of the Palestinians’ books as part of the National Library’s collections thus constitutes a violation of international law. … The questions about identity that these books and their ownership represent are an inseparable part of a national struggle over culture and heritage,” writes Amit. The debate about the status of the books’ owners and their heirs who live with us in this country or outside it, and who have failed in their efforts to get their libraries back, is described at length in this book and illustrates the saying “The more you know, the more you grieve”. That saying applies just as strongly to the collecting of manuscripts of Jews from Yemen, which stemmed “from the Zionist perception of the Yemenites as ancient Jews, bearers and preservers of an ancient culture, but also as inferior in cultural, religious and national terms”; hence it was best to take their cultural property from them in order to preserve it for the nation. The book, which expatiates on these cases, the circumstances in which they occurred, and their meaning both then and now, presents an alternative view on these issues of theft, preservation and appropriation of cultural treasures. The author argues that “the National Library is not a site for impartially and innocently collected knowledge; it is a site for the creation of power and the institutionalizing of identity. It is the place where knowledge is produced, organized and divided into vertical and horizontal ethnic, class and national categories,” because the library, like every other national library, maintains a dialectical relationship between preservation and plunder and between rescuing and stealing – and preserves the traces of the injustice and the memory of the disaster. Amit opens the discussion with a quotation from Mary Beard: “Libraries are not simply the storehouses of books. They are the means of organising knowledge and … of controlling that knowledge and restricting access to it. They are symbols of intellectual and political power, and the far from innocent focus of conflict and opposition,” and concludes it with a quotation from Mary Douglas: “Objects are always coded signs of social meanings”. Amit adds: “The National Library is a place that turns objects into an inseparable part of a social world that weighs them and accords them their value according to its own values and needs”, and adduces the Archbishop of Capetown Desmond Tutu’s statement that apology/forgiveness is a very powerful third way between forgetting and revenge, one that could extricate communities from historical cycles of violence and counter-violence. I’ve cited only a little of the detailed, complex and illuminating discussion in this book, which draws on archives, documents, books, stories, interviews and memoirs in several languages. Clearly one could argue with the author and present the entirely different viewpoints of the library’s management and staff, who believed they were engaged in work of rescue and preservation in relation to all three cases that the author discusses, but it’s impossible not to be astonished at the new angle of vision that is revealed to those of us who use and love the library, things we didn’t know about regarding how the library’s open and hidden collections were created, about the circumstances in which they were collected, and about their origins and their disputed political, national, cultural and legal status. Getting to know the alternative stories– as painful, horrifying and illuminating as they may be – in the three books reviewed above shows us that there are many ethnic stories and several national stories, not only one: not only the hegemonic national-Zionist story about what happened in the first half of the 20th century and not only the national-Arab story; not only the story of the Ashkenazi hegemony that wrote the history books in the first decades after the establishment of the state, but also alternative stories of groups which feel that injustice has been done to them in various contexts, in a period in which they were excluded, discriminated against, silenced in the public discourse or dispossessed of their cultural property. The three books, which courageously confront some dark and decisive moments in times of crisis and tragedy, show , from different angles, that everywhere, beyond the darkness of enmity, beyond the incitement, the nationalism, and the religious or ideological tension, and beyond the dispossession, the stealing and the injustice, there were and there are various possibilities of apology/forgiveness and reconciliation, and there were and there are unexpected displays of mercy and grace and of universal humaneness; of recognition of the value of human life and of a complex approach to the other’s culture, identity, story and point of view. I’ve written about these things before (see IsraelandPalestine), but now they seem to be getting clearer, to me at least. It’s also clear to me that a two-state solution, with a “State of Palestine” limited to the territories left to the Arab Palestinians since Oslo, is no longer viable, if it ever was. But it’s becoming equally clear to me that only a two-state solution (which need not be based on territorial division) can fulfill the emotional & spiritual needs of the people of the two nations that live (in terrible inequality & inequity) in this little land. & the reason for this is that these people have two different languages, two different cultures, with all their symbols, etc. I see all these images of Palestinian protesters waving their flags, & of Israelis waving theirs, but the crux of the matter goes deeper, & it begins with language, the first of all these things that people need to feel they belong to a nation. & apparently most people do feel this need. Could two nations do this in one state? Perhaps in time, if some sort of cultural autonomy were assured for both. But more probably, it seems to me, before such a time, the Arab Palestinians will need to feel at long last the dignity & pride of national independence, & Jewish Israelis will need to feel (also at long last) the dignity & pride of no longer being oppressors. Who is it that’s there? to carry my pain for me. But who is it that shackled Arabic to you, my son? And why will you sing in a foreign tongue? and exiled the Arabic melody? in the foreignness of the Hebrew language. And how do you lament, my son? How do you lament? the prayer’s voice asked pityingly. like an illegal inhabitant in his homeland. for a moment of family unification. Words, words, words… Mountains of philosophies have been written about words & language & still, the power, the representational character & the meaning of words always remains partly subjective & mysterious, not fully grasped. Something that can’t be defined precisely, something you can only understand something about through examples, a little like God, or love. 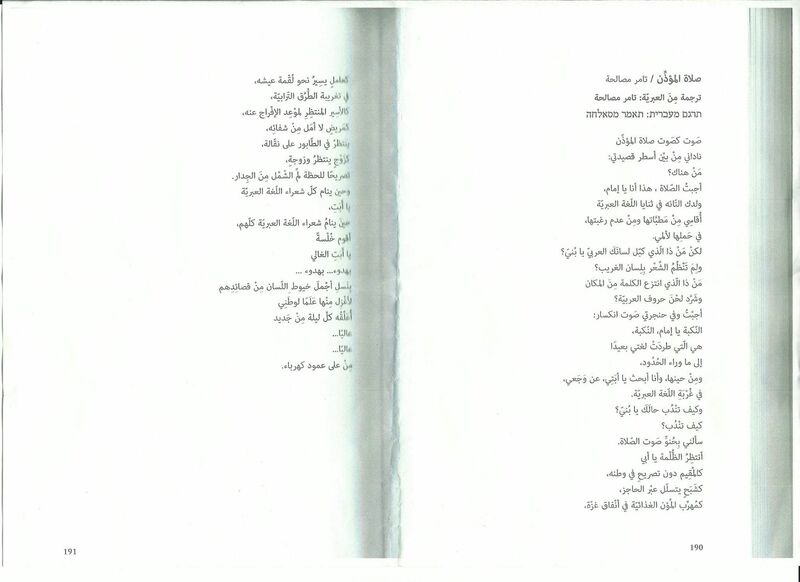 Our group of adults for joint Jewish-Arab life here met again yesterday, and together we worked on this poem that is attached here – The Muezzin’s Prayer, by Tamer Massalha. This poem threw me – for whom words are such a major and important part of my world – in so many directions, that there’s not enough space, and in any case there’s never enough time to pause over everything, so I’ll lay them down here, the words that filled me, so as to see what picture they’ll return to me. When we were asked to share a personal experience the poem evoked in us, I remembered one time, long ago, more than a decade ago, when I was facilitating a meeting of Jews and Arabs in an activity of the Peres Center for Peace. I remember in particular how astounded I was, then, that the meeting of Arabic speakers & Hebrew speakers was being conducted in English. How can this be, I thought, it’s ridiculous, especially since everyone speaks Hebrew. “We don’t want to speak in the language of the occupier”, they said then, though all of them could speak Hebrew fluently, and only then I began to understand what this means. In the group there are people who prefer “to do” than “to be”, & one of the proposals for doing that’s always on the table is the matter of signs on the Israel National Trail. I’m not a trekker, so I haven’t seen this myself, but I understand that all the signs along the trail are only in Hebrew, not in Arabic. During the talk yesterday the matter of signing came up again, from another angle. The disregard for signing. How on signs throughout the country the writing in Arabic is full of errors, distorted names and incorrect spelling of existing names. & I recalled yet another angle, how, years ago, for some reason, I agreed to go to a meeting at the Shiloh settlement. I think it was the first time I’d been in the [Occupied] Territories. The landscape was spectacular, a truly biblical experience. & within all this beauty I was astounded to see that all the signs pointed only to Jewish settlements, in Hebrew. Every trace of the Arab villages that exist there was simply erased. I remember how horrified I was then. How was it possible to nullify parts of reality like this, what does it say about the people who do this, & how easy it is to do this by means of language. “There are words,” some Arab friends said in this conversation, “that we, among ourselves, in our everyday speech, will say in Hebrew. We have no words in Arabic for those things”. A shackled language, Tamer Massalha wrote in his poem. & I recalled conversations I have with my relatives in the USA, in English, which I speak very well, yet there’s not even one time that I don’t have the feeling that no matter how precise I am, it will never be as precise as I can be in Hebrew, my mother-tongue, my language. A feeling of sadness & loneliness & helplessness. True, it passes, it’s momentary, but it’s always there, that moment of knowing that there’s no chance that they’ll understand me truly, in English, the way I intended. Because a language is a culture & a history & a society, & when the language doesn’t develop, when it’s shackled, that diminishes the culture & the history & the society. & so the conversation came to this disputed woman. Zoabi, said one of the Jewish participants. Say Haneen, an Arab woman corrected him. & I thought: how is it that she’s insisting on something that to me seems like a diminishing. When I see that in the newspapers they refer to Tsipi Livni as “Tsipi” and Isaac Herzog as “Herzog”, I see it as a classic expression of male chauvinism. And here, it’s the opposite. Another little instance of a different language, behind which is a representation of a different culture. A different understanding of the nuances of the language, which in the best of cases produces friction, and in the worst – war. Our discussions are conducted entirely in Hebrew. Initially we were strict about translation – whatever was said in Hebrew was translated into Arabic, and vice versa. But as the relationship developed & trust was built, we understood that this complication slowed us down, and we remained with “if something’s not understood, it’ll be translated into Arabic”. And for me, every time I hear them speaking that soft language of theirs – with its sounds that I’ve found pleasant from encounters since I was 18, but I’ve never been able to make time to learn it – for me it always brings sorrow. & appreciation. I respect & appreciate them for their deep knowledge of my language, & am sorry I don’t have such a knowledge of their language. There’s a statement there, in the fact that there really isn’t a common language. “Death and life are in the hands of language”, it says in Proverbs (18.21). Aha. Exactly. A new word I learned yesterday. It has no equivalent in Hebrew, as far as I know. “It has to do with music”, the friend who taught me the word explained. “it’s when you fully enjoy music, you’re entirely in the music, you reach a transcendence through music”, he said, searching for words to describe it. & I felt a new field opening up in my mind, & I started to sprout this word there. Tarab. It’s like tarbut [the Hebrew word for ‘culture’], I thought. A culture of music. & in this new field, this connected for me with the well-known saying that the Eskimos have lots of words for snow, because snow is so much a part of their lives. & here, opposite us, there’s a culture that we don’t trouble to know, and indeed we even seem to do the opposite. This was a powerful meeting. A meeting with others, with other opinions, other ways of looking at a shared reality, a collision of concepts. & nonetheless, & above it all, we already have such a cloud that cannot be defined precisely, that we can only understand something of it through examples. A little like God, or love, or Tarab. 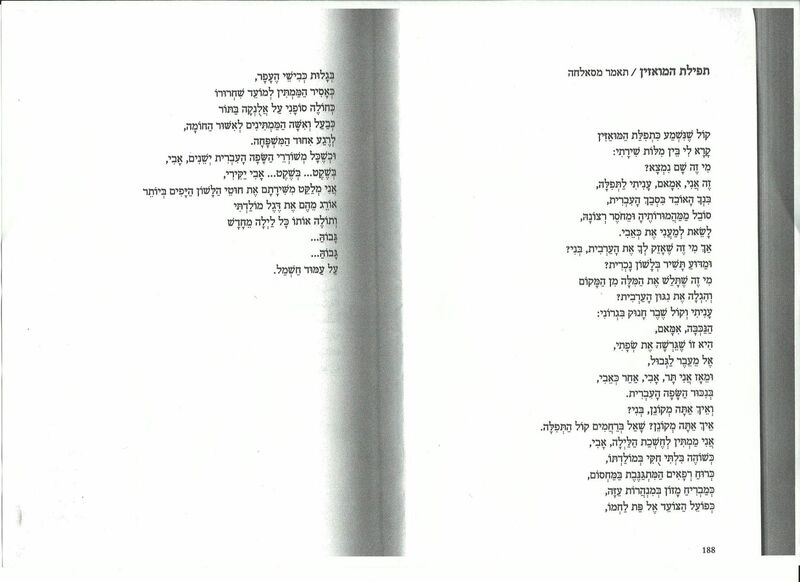 For other posts with translations of Ayala Shalev, see Hope for Palestine[..]? & Identity? It isn’t easy being a person. to follow their true humane impulses. & the right, it’s said, is stronger than ever. But what does the silent majority really feel? so we choose to be oppressors. It’s a dog eat dog world)? with their true humane impulses? neither violent racists or nationalists or goodie-goodie idiots. Is this who I want to be? Is this what it is to be human? “love the stranger,” Judaism says. Is how it is how I want it to be? in one’s daily consciousness. They are quickly suppressed. whatever we don’t really like about ourselves, our true natures. whether we’re conscious of it or not. for no human will willingly accept such oppression. already in the last few months things have been getting worse. & the list could go on & on: check out The Palestine Project‘s updates. & nothing serious enough is yet being done about it? to life on our planet: global warming, & quickly! & inhumane treatment & exploitation of other human beings. when they feel the sad truth. pulling strings, manipulating governments & publics & media. be an end to this intolerable ongoing state of affairs. for all the injustices they have committed against Arab Palestinians. & I think the only way, to bring true reconciliation. we’ve caused since the 1967 war. We felt we had no choice. to treat you as we did, even before that. of human rights we have committed against you. we should now vacate the place entirely. & there might be some justice in that position. & Israel is their only homeland. & we have a haven here for Jews who may need it. We will not, cannot, give up these things. with guaranteed & safe access for Jews to the Western Wall. We will accept the Arab League’s Peace Initiative of 2002. We will withdraw from the territories occupied in 1967.
the Confederation of Israel & Palestine (CIP). both nations committed to doing their utmost to sustain the reconciliation. We reject the idea that Israel is the national state of the Jewish people. that has arisen in Israel in Palestine. & of equitable restitution to those we have dispossessed. & we think the CIP could establish courts to deal justly with individual claims. & that recognized the State of Israel & supported it during all the years since. They too must pay their share in making this reconciliation a success. We know that our greatest problem with this reconciliation is security. in this reconciliation. We must establish trust between us. Such things have been done before in the world, & can be done by us & you. not only no more war, for real, but peace of mind & soul at last, as well. get elected, & form a government that’ll do this! & let the reconciliation process truly begin. to articulate & publish the vision, even if it seems deluded, or megalomanic. & its best minds can give their full attention to the global dangers. 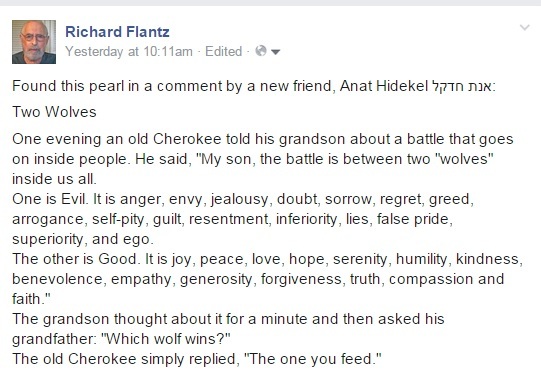 * If you want to know why i keep writing “conflict” inside quotes, see this link. A fascinating, illuminating (& painful, but the kind of pain that must be borne if one is to be honest with oneself & conscious of one’s complicity, however tacit – the non-indigenous resident’s burden everywhere where indigenous people have been dispossessed, dehumanized, deprived of basic human rights, humiliated, marginalized, decimated, massacred, or whatever) part of the last few days since I published my earlier post on these “Witnessings” being collected by the indefatigable Naomi Wolf on her “Daily Cloudt” page has been following the continuation of the posts that have been rolling in, & that she has been publishing in between her numerous posts on more current matters in Israel in Palestine & elsewhere in the world. I think this is a wonderful use of social media, & serves a good purpose, because it makes us aware of the reality of the life in Palestine that was changed so radically by the Zionist project, & forces us to acknowledge that driving out Arab Palestinians was a deliberate part of that project at least among the Zionist leadership. 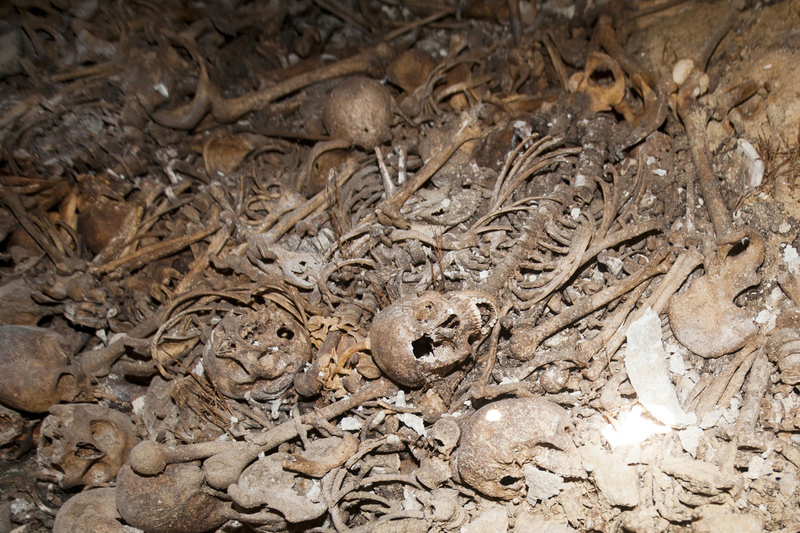 How much the majority of the Jewish population of the Yishuv knew about this is a different question, & is perhaps similar to the question of how much the majority of the Germans knew what the Nazi leadership was ordering to be done, or how much the majority of Australians in the 19th century knew what measures were being taken against the Aborigines here (“It is impossible to know how many Indigenous people were in Australia before the arrival of the first white settlers, but it has been estimated to be anywhere between 300 000 and one million. By Federation in 1901 that number had dropped to as few as 20 000” [source]). I think of Palestine & of Australia more than I think of America or Africa or other places where the processes of colonialism have brought much misery as well as “progress”, & where many of us non-indigenous people live our lives on land once populated or worked by now-excluded (if not eliminated) indigenous people, because I have a special & complex biographical connection to, & emotional involvement with, both (see About me & this blogsite). I’ve once more collated these posts in the order they appeared, from earliest to latest, starting from where I left off last time (the 4th to the 11th items in the list are photos, preceded by the text that appears in Naomi’s post). Going through them in this sequence can recreate the order in which they became part of recorded history thru this Facebook project initiated by Naomi. Remember: in many of them the comments are as much (& sometimes more) worth reading as (or than) the posts themselves. I think it’s important to stress that the Hebrew word התנחלות (hitnaxhlút), generally translated as settlement, refers specifically to Israeli-Jewish settling on Palestinian land occupied by Israel in 1967, & is radically different in meaning & spirit than the Hebrew word התישבות (hityashvút) that denotes any kind of settling and was the only word used for Jewish settlement in Palestine prior to the establishment of the State of Israel & still denotes settlement on land within the “Green Line”. Both are modern nounal verbs (or verbal nouns), & are ‘reflexive’, meaning that they denote ‘making oneself such-&-such’. Both, too, stem from biblical roots with very strong connotations. התישבות (hityashvút) stems from the root ישב (yasháv), to sit or dwell, & means the act of settling oneself, establishing one’s home somewhere. From the same root comes the word ישוב (yishuv) which means a place of settling or settlement, be it a village, a commune, a town or a city. In the plural all such places are called yishuvím. Also, in pre-Israel Palestine, the entire Jewish population & its institutions were known as the Yishuv, the Settling. But התנחלות (hitnaxhlút) stems from the root נחל (naxhál), to receive a tract of land as a rightful inheritance, & actually means to make oneself the receiver (& in practice the taker) of such a tract. There are many biblical references to such tracts – נחלה (naxhaláh) in the singular, נחלות (naxhalót) in the plural – given by ‘God’ to the Israelites, to the different tribes, to families, & to individuals. The use of this term implies that the takers are actually accepting what has been given to them by ‘God’. At the same time, it is a blatant & shameless, aggressive term that does not hide the fact that what it refers to is appropriation of land that can then be passed by inheritance to succeeding generations. Another interesting fact is that the same word is used both for the act of taking land in this way & for the settlement that is established in such a way. Thus ‘settlements’ in the Occupied Territories are called התנחלויות (hitnaxhluyót). I know that it is too late to change the current usage in English. Also, there is no equivalent English word to translate the Hebrew word התנחלות (hitnaxhlút). (The closest might be something like appropriation for the act, & colony for the place so appropriated; it would need to be a word that also projected the arrogance implicit in the Hebrew word, the sense of divine right &/or duty to obey a divine commandment that is felt by the more fervent “settlers” if not by the opportunistic land-grabbers who have jumped on their bandwagon.) But I do think this is something that people who think & care about the situation in Palestine, but don’t know Hebrew. should know about.